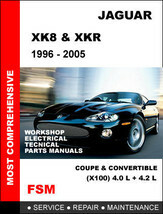 FSM About the manual: Model: XK8 XKR Coup Convertible. (X100) Engine: 4.0L , 4.0 L Supercharged , 4.2 L , 4.2 L Supercharged *covers entire production run, vehicles made in USA, Canada, UK and rest of the world models are all covered. 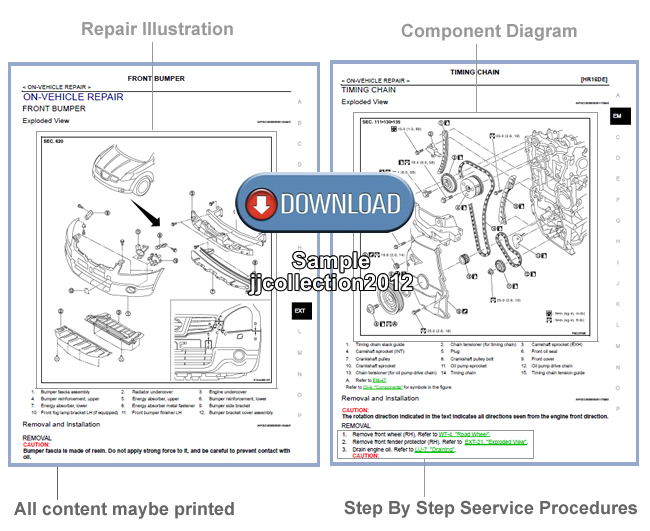 This factory service repair manual is a must have! It's the very same manual used by the certified mechanical in your local factory dealer to ensure your vehicle is serviced and repaired correctly . It's the most comprehensive manual available and covers every service and repair imaginable from basic adjustments to rebuilding the engine. 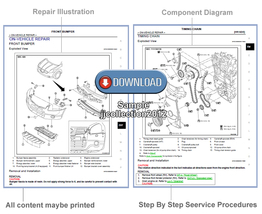 The manual features step by step service procedures, repair illustrations, detailed wiring diagrams, manufacturer specifications and are easy to follow. Payment Download Delivery: We accept Paypal payment and within several hours of your payment, you will receive a link to download a .zip file through your Paypal email address. Which contains the manual in .pdf format. This is not for a physical BOOK manual or CD to be sent to you in the mail, but rather you will be downloading the manual to your computer. This means you will be able to access the manual the same day you purchased it, as opposed to waiting for a CD to come in the mail. You will be able to print, copy to a CD or USB stick, search and quickly navigate this easy to use manual. Our 100% guarantee: If for any reason you are not 100% completely satisfied, please know that we offer 100% money back guarantee. And if you do not see the manual that you are looking for, please contact us as we have great collection of factory manuals that many of them are not yet listed here. We look forward to assist you in all your maintenance and repairs needs with the most comprehensive manual available today! Please visit our store for "Buy It Now Auction" and other factory repair manuals! Item may also be delivered on CD-ROM: We can also delivery the item on CD, however extra shipping charge do apply to cover the postal cost, for delivery to Canada cost 5.95 , for delivery United States cost 5.95 , for all other International country cost 9.95, please contact us if you should have any question. Thank you! Licensure: FSM Incorporated - Factory Authorized Service and Owner Information. All Rights Reserved. 14310 Hamilton Ave. Highland Park, MI 48203, USA.